Rangatahi who took part in the Te Puna Mātauranga programme with Te Kupenga Hauora - Ahuriri Social Worker in Schools (SWiS) Hinerangi Wilson at Ātea a Rangi. The programme, developed by Hinerangi and her colleague Paul Hedley, aimed to help rangatahi aspire to higher learning and build practical skills around confidence and communication. The SWiS team work across three local schools to awhi rangatahi who need their guidance. 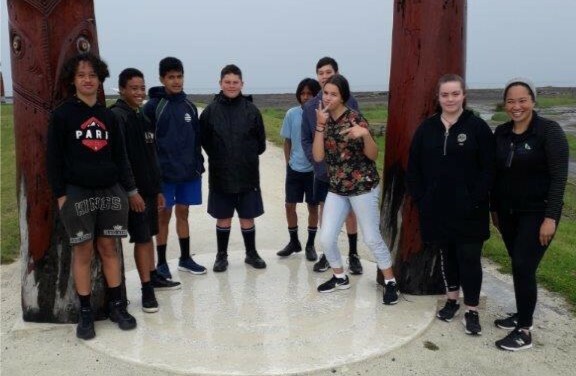 Te Puna Mātauranga aimed to capture these students prior to them starting secondary school, in order to bolster their confidence, resilience and grow communication and relationship building skills. By utilising trips to local landmarks participants gained general knowledge as well as more personal practical experiences. Over the two days they visited Te Mata o Rongokako to focus on whakapapa, Ātea a Rangi (Star Compass), The MTG (Museum Theatre Gallery) where they learned about Tangaroa through the George Nuku “Bottled” exhibition, spent time learning the traditional Māori game Ki-o-rahi and attended a shark seminar at the National Aquarium. For some they were visiting these places for the first time and across the locations they shared prior knowledge as well as fed back new things they had picked up. “It was key that we give them all an opportunity to succeed in learning this way,” says Hinerangi. The programme was so successful TeKupenga Hauora - Ahuriri are planning a longer version for later this year. The SWiS team work with young people that are referred to them from a number of sources. There are often a number of challenges they face day to day. The SWiS social workers focus on their overall social wellbeing.“Our rangatahi have so many dynamics to contend with these days. We are able to help them find strategies to cope and thrive”.